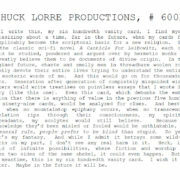 Chuck Lorre posted his 600th show-ending vanity cards after The Big Bang Theory and Young Sheldon tonight. CBS has announced that acclaimed comedy Mom has been renewed for a sixth season, to premiere this fall. The show currently airs Thursdays at 9:00. Chuck Lorre’s writings will be collected in a book called What Doesn’t Kill Us Makes Us Bitter.